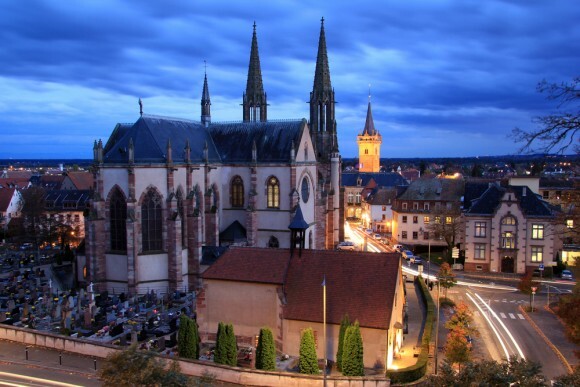 For most people in our community, visiting beautiful Straßbourg is the “go to” town in the Alsace. One of the most popular or worthwhile event in this city is the December Weihnachtsmarket, which is the oldest Christmas Market in France. Taking place in the main square of Straßbourg, the streets are lined with scents and sites that are a feast for our eyes. However, sometimes I like to venture off track for adventures and misadventures. 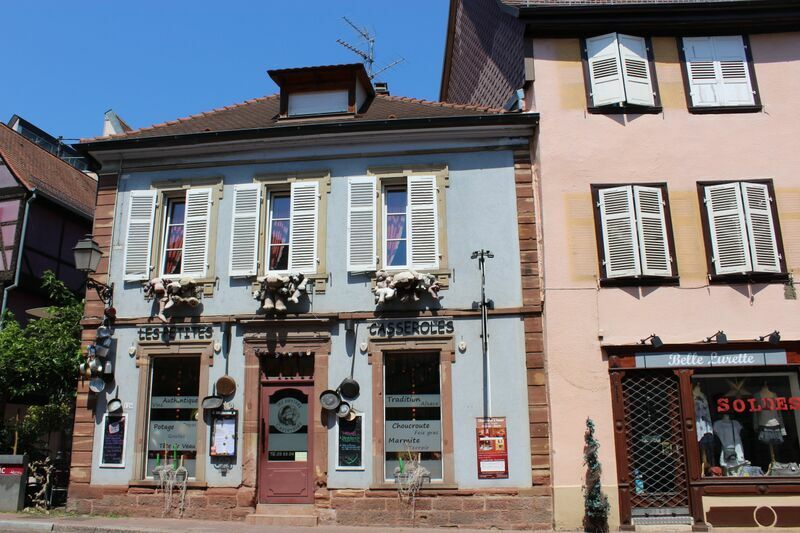 Last year I was introduced to three smalls towns in the Alsace- Obernai, Rosheim and Soufflenheim. The first time I visited to Obernai in the Alsace, I remember hearing church bells as we approached this tiny village. 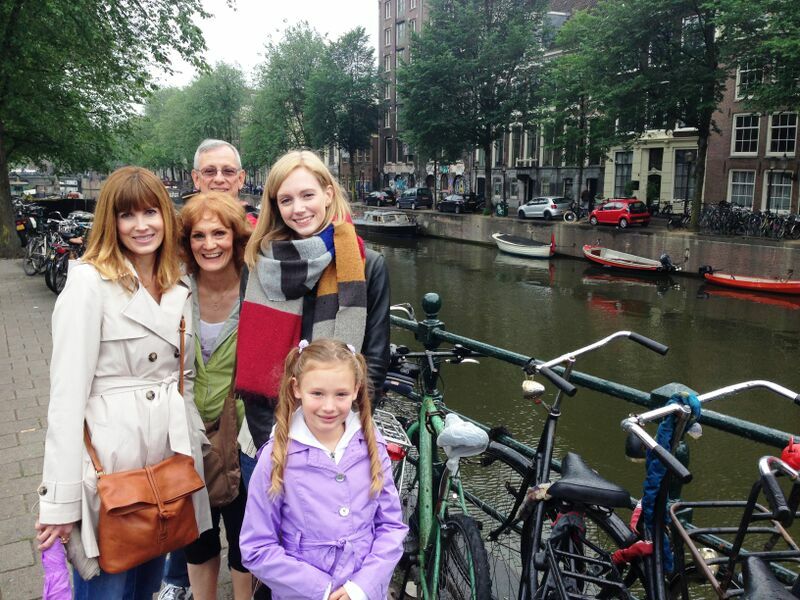 Visiting several times since, the precious town looks like it stepped out of “Beauty and the Beast.” This summer my friend Shelly and daughter Katy came along and we decided to have a sing-along with Belle’s greatest hits. The information center located right off the main square makes it very easy to find an English map and find yourself around. 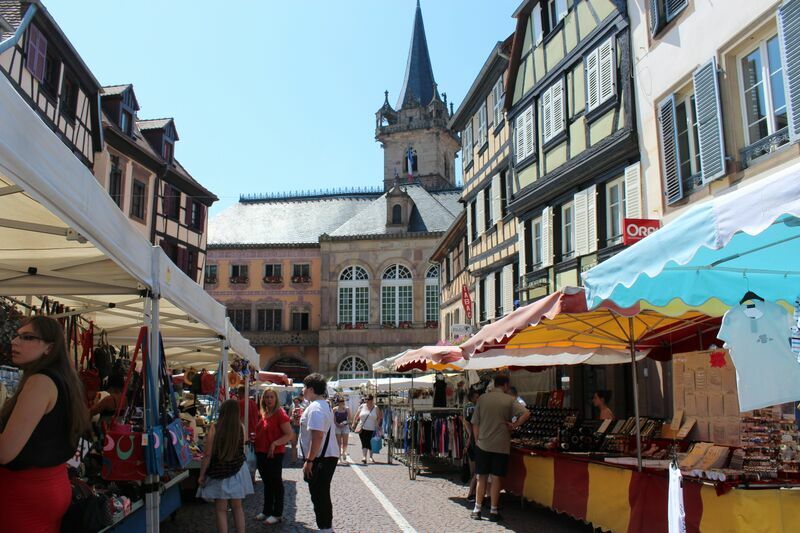 Every Thursday from 8 a.m to 12 p.m. on the main square in Obernai, there is an amazing farmer’s and flea market and it goes on from street to street to street. You will find the freshest of meats, cheese, tea, herbs, fish, clothes, shoes, linens, oh and an occasional mattress stand. Random I know, but don’t knock it! Someone may need a mattress. 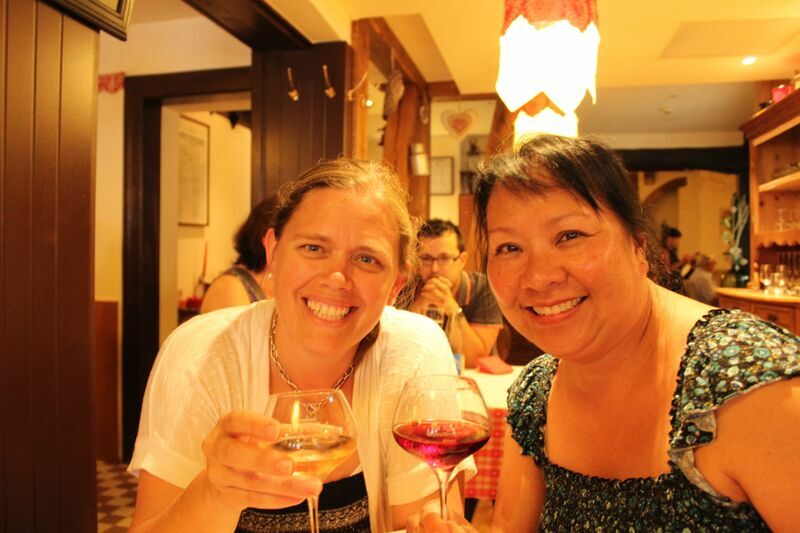 Dotted with several delectable eateries, it will be a difficult decision where to dine in Obernai. 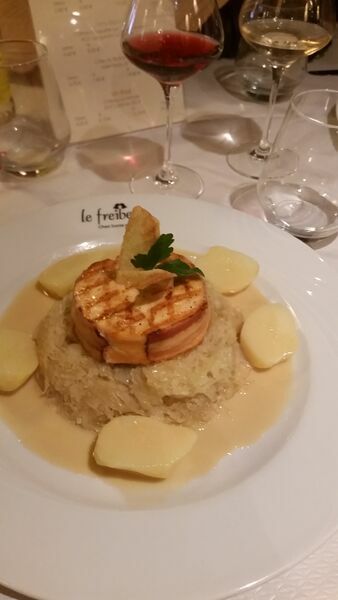 Whether you give a try to Les Petites Casseroles or the Winston Restaurant Le Freiburg, you will not be disappointed. This visit we tried the Winston Le Freiburg. Shelly had bacon-wrapped Salmon over sauerkraut and sauce, Katy went right for the Cremé Brúlee (because you should eat dessert first in France), and I had a wonderful green salad. Les Petite Casseroles is a unique restaurant where your dish is served in small casserole dishes and the combination are mouth-watering with cheese, bacon and pasta. They are not open this summer for lunch, but I’m sure they’ll be back on track this fall. 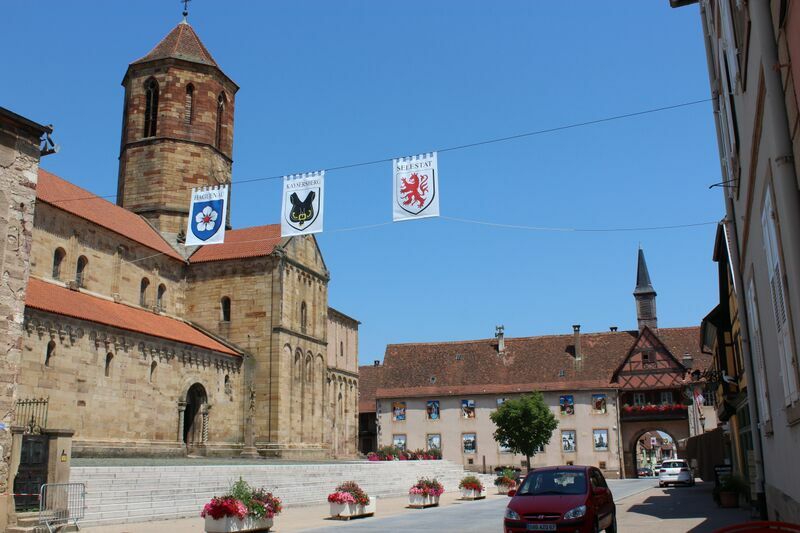 In the medieval town of Rosheim you see the double Roman walls and the Church of Saints Peter and Paul. This awe-inspiring cathedral is the anchor for this town and covers a few city blocks. We were lucky for this recent visit as there was an art exhibit of magnificent paintings on display in the church. Built in the 12th Century and surviving the French Revolution, this church is considered the gem of churches in the Alsace. After touring the church, we popped in at the bakery across the street. 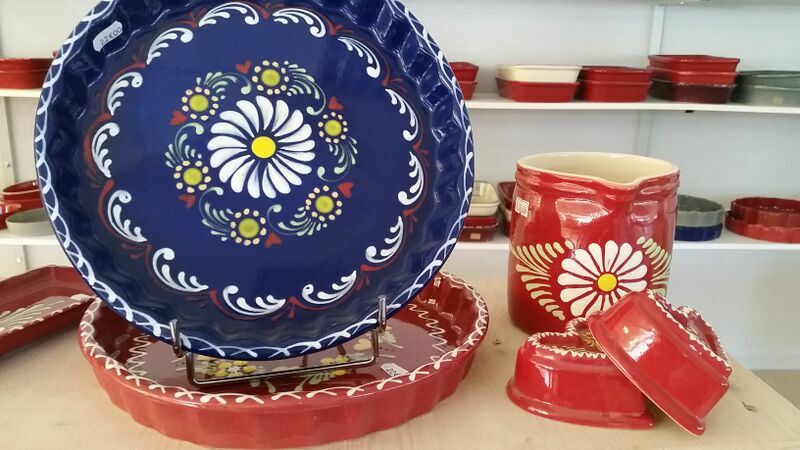 Known for it’s ceramic pottery, Soufflenheim is the “Land of the Haguenau Forest and Land of Potters.” This town is also known for it’s active tourism, hiking, biking and especially golfing. This August they will also be celebrating the 19th Festival of Pottery with local potters, workshops, music and French culinary specialties prepared on-site. 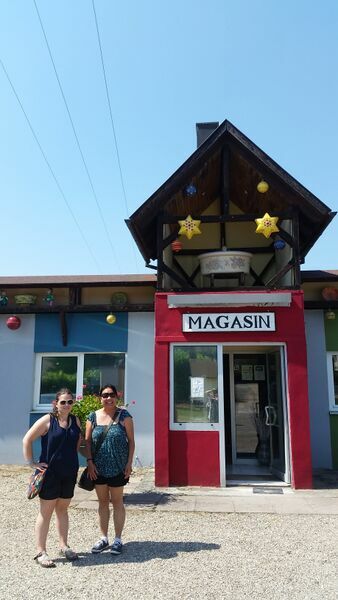 Because of their proximity to Stuttgart and to each other, visiting all three can be done as a day trip. With such a short distance from Obernai, I set my GPS to back road mode to Rosheim in order to travel through wine country. Once leaving Rosheim, then set your GPS on highway mode to Soufflenheim. A drive to Obenai is under 2 hours southwest of Stuttgart, just over 2 hours south of Kaiserslautern and approximately 2 hours and 45 minutes south of Wiesbaden. You can also click on DB Bahn for train information. 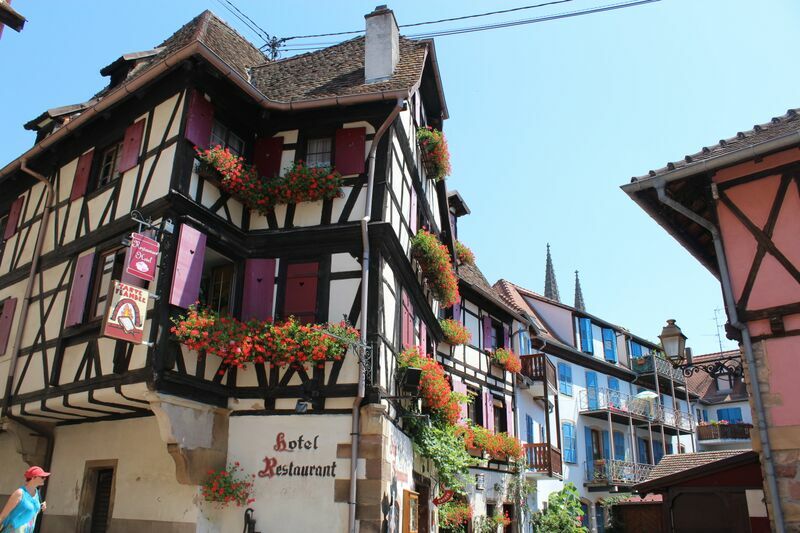 Find nice hotels in the Alsace region here!